The Ringing Cedars - Articles: What is Cedar Nut Oil for? If you are involved with cedar products, have read much literature about cedar nut oil, and are using cedar nut oil almost daily, occasionally you may be surprised by the question that sometimes arises: "Cedar nut oil, but what is it for?" Nevertheless, this question arises fairly often. Life is astonishingly multifaceted and diverse. To the extent that different people will quite often find confirmation of completely different claims in one and the same phenomenon. There exists a fairly large number of natural remedies, whose use gives good restorative and medicinal results. And it is probably not that important whether a person will choose this or that remedy, the main thing is that the person wanted to make his or her life better, wanted to obtain positive results, and in the end used the chosen remedy. Some people use pharmaceutical multivitamin complexes and consider that they use them successfully, while some people do not trust pharmaceutics all that very much, and look for something natural, such as, for example, Red Sea products, aloe juice, or cedar nut oil. And it is impossible to say that this one is better, and that one is worse. The entire point is the person's choice and his or her intentions. The selection is considerable, and diverse information about natural health remedies may be found not only on the Internet, but in various magazines, newspapers, and on television. Returning to the question, just what is cedar nut oil for, we can begin with the fact that, first and foremost, we have in mind a product for use in food, or a biologically active supplement - the oil of cedar nuts. 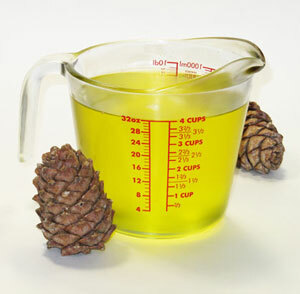 This is a virgin oil, obtained by cold pressing of kernels of cedar nuts from which the shells have been removed. Many people look precisely for virgin olive oil on supermarket shelves. This type of pressing makes it possible to preserve all the vitamins, biologically active substances, and trace elements in the oil. In this instance, cedar nut oil presents all the healthy properties of cedar nuts in a concentrated form, which indeed makes it such a valuable product. 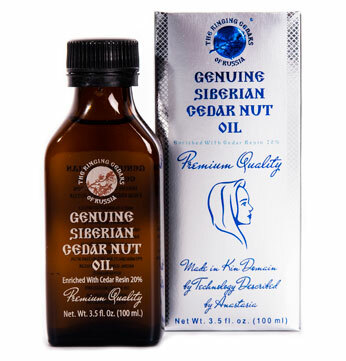 Thus, cedar nut oil is a source of a valuable complex of vitamins, trace elements, and mineral substances. This contributes to its wide use as a natural multivitamin. magnesium - there is no other food product that can compare with cedar nut oil in the quantity of magnesium. Magnesium dilates the blood vessels and reduces the heightened excitability of the nervous system. Thanks to the fact that so many vitamins and healthy substances are combined in cedar nut oil, it is also used in folk medicine as a stimulant for the immune system in cases of various symptoms of indisposition or vitamin insufficiency. Cedar nut oil is also used for preventive purposes as a general fortifying remedy to fight chronic fatigue syndrome, to increase physical and mental work capacity, and for the preventive treatment of age-related illnesses, such as atherosclerosis, disorders of the digestive organs and heart. Several alternative methods exist for the use of the oil. For preventive purposes, the most effective is the following: 1 teaspoon taken 30 to 60 minutes before meals, 2 to 3 times a day, for a period of 40 to 60 days; however, a noticeable effect is also obtained from a single, daily dose of one tablespoon of cedar nut oil on an empty stomach. To assimilate it best, it is preferable to absorb the oil in the mouth. 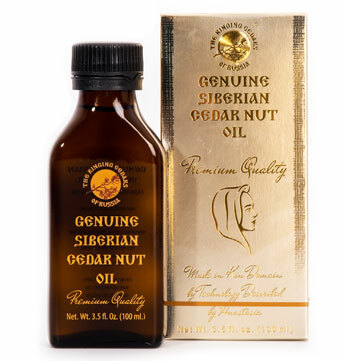 Virgin cedar nut oil has an attractive light-amber colour and a pleasant nutty fragrance. Its flavour qualities surpass the best grades of olive oil and almond oil, and the strength of its medicinal effect exceeds sea buckthorn, burdock, coconut, and high grade olive oil. Cedar nut oil has also been used for a long time as a valuable vegetable oil for the preparation of food and various sweets. Of course, it could be afforded only by residents of the taiga and neighboring provinces, as well as well-off people who knew about the amazing properties of cedar nut oil. Residents of Siberia prepared a "vegetable milk" and "vegetable cream" from cedar nuts. The kernels were extracted from the dried nuts, they were dried more, the skin was cleaned off by hand rubbing. The dry kernels were crushed in wooden mortars, hot water was added a little at a time. The gruel-like substance obtained was poured into a cast iron or clay pot, and was brought to a boil in a Russian stove - and the cream was ready. Before use, boiling water was added to the cream, and vegetable, or cedar nut milk was obtained. In its fat content, cedar nut cream is twice as rich as dairy cream, and two and a half times as rich as meat. The calorie content of cedar cream is higher than all the products named. Nut cream and milk, as a medicinal remedy, have been used by folk medicine since days of old. In 1786 the Academician P. S. Pallas wrote that the vegetable cream "is used in chemist's shops, a milk is made from it, a milk that is prescribed for chest illnesses, the cream is used effectively by people with consumption." There exist a large number of excellent culinary recipes both using cedar nut oil as well as using cedar nuts, and cedar flour. Interesting recipes and also much useful information about the use of cedar nut oil and other cedar products may be found in books. Cedar nut oil is an ecologically pure product without any contraindications, and is most completely assimilated by the human body. Cedar nut oil is not an inexpensive product, and cannot be inexpensive by virtue of the special features of its production. But the price of cedar nut oil is completely comparable to the price of pharmaceutical multivitamins, which often provoke allergic reactions and have a fairly questionable effectiveness. Abroad, cedar nut oil is very highly valued, it is no accident that Western companies try to buy up and export cedar nuts by fair means or foul. Yet another area where cedar nut oil is used is cosmetics and personal care products. The presence of biologically active substances, and especially the large quantity of vitamin F, makes cedar nut oil a wonderful base. In conclusion, when speaking about the truly marvellous properties of cedar nut oil, we would like to note that, of course, cedar nut oil, just as other natural products, is not a panacea or a medication for all diseases and ailments. Rather, a panacea may be considered to be the daily, practical efforts made for the good of one's health. A broad, systematic, and rational approach is always required - both for prevention as well as for treatment. It is in this type of rational and multifaceted approach that cedar nut oil may become one of the basic constituents for effective treatment. If we speak of the daily use of cedar nut oil as vegetable oil, then here, as in everything, it is good to have limits. On the Internet you can find the enthusiastic opinions of a woman who writes that she even fries potatoes in cedar nut oil. Perhaps this is a good thing, but most probably not all together rational. After all, cedar nut oil is fairly expensive, and it is well known that prolonged heating breaks down the vitamins and biologically active substances. And besides, the excessive use of even the most beneficial substance may do harm. So, I wish to conclude this essay with wishes that you take care of your health in a well-rounded way and, mainly, that you do it daily, and use cedar nut oil in your food in moderation, preferably in the "raw" state. Yes, and remember that it is best to store cedar nut oil in the refrigerator. With wishes for health and joy.